THE BANGALORE INSTITUTE OF TECHNOLOGY is located in the heart of Bangalore, the "Electronic City" and "Silicon Valley" of India. The institution came into being in August, 1979 under the auspices of Vokkaligara Sangha, Bangalore. The institute offered the Bachelor of Engineering (B.E.) Degree in Civil, Mechanical, Electrical & Electronics, Electronics & Communication, Computer Science, Instrumentaion Technology Telecommunication & Information Science & Engineering. 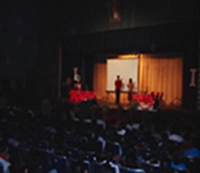 Bangalore Institute of Technology has always been at the forefront of modern technology and is credited with the introduction of the first full-fledged COMPUTER SCIENCE & ENGINEERING degree in Karnataka.Thus, the institute has identified future growth areas and incorporated various courses over the years. 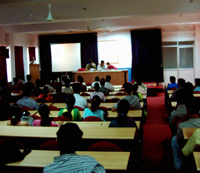 At present B.I.T offers 9 undergraduate, 6 post graduate and a Ph.D course(s) with a student strength of more than 2500. Believing strongly in the motto "Technology for Prosperity" the college has seen phenomenal growth in the last two and a half decades bringing innovation to every road we have traveled. Inside this campus the possibilities seem limitless. You will find cutting-edge technology, state-of-the-art equipment and minds that push the envelope of theory and experimentation. There are a number of centres carrying out inter-disciplinary research and many collaborative programmes exist between the college and other institutions, like IISc, N.A.L, etc.The chemistry department has been recognized as one of the latest research centres in the state of Karnataka. The college is also a program centre for IGNOU. Teaching & research work is also amply supported by facilities such as central library with 30000 volumes of text books and reference books, and an INDUSTRIAL CONSULTANCY AND RESEARCH CENTER. Besides this, the institute also offers the facilities like auditorium (1200 seating capacity), seminar hall, co-operative society, canteen, full fledged sports and cultural sections as well as hostels for boys and girls.